Aurora, ON (April 18, 2017) – With the recent tabling of federal legislation Canada continues its march towards the legalization of marijuana. A new State Farm Canada survey released today found a number of emerging trends which reveal Canadians’ perceptions about marijuana use, its safety, and driving while under the influence are evolving. Generally, the path toward legalization seems to be changing how Canadians feel about marijuana, largely in a more accepting way. 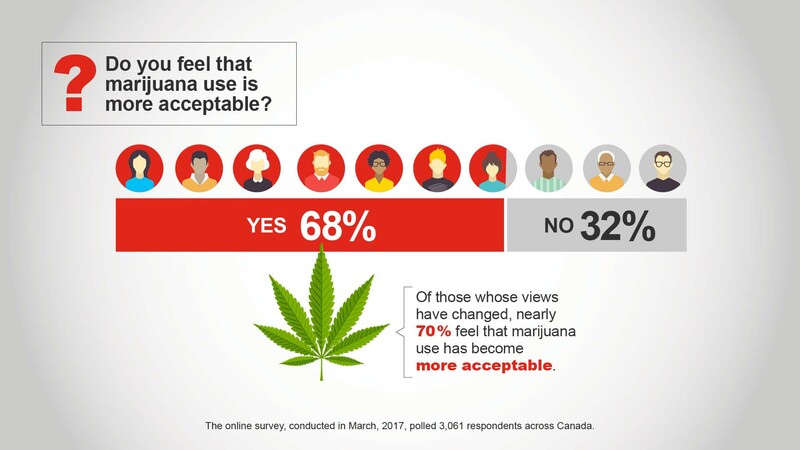 One out of 4 survey respondents say that their views on marijuana have changed since Prime Minister Trudeau announced his promise to legalize marijuana. And of those whose views have changed, nearly 70% feel that marijuana use has become more acceptable. On the issue of marijuana and driving, those who use marijuana see things quite differently from those who do not. One in 10 respondents admit they have driven under the influence of marijuana (45% within the past 12 months), but nearly half of this group say they don’t believe marijuana impacts their ability to drive safely. This is an increase of five per cent from 2016, but also shows that users have a very different view of driving while high than the rest of the population. When the same question was asked of Canadians in general, 73% felt that marijuana use would impair the skills necessary to drive. Do you feel that marijuana use is more acceptable? What do you think would make people stop driving under the influence of marijuana? Do you worry about people driving under the influence of prescriptions drugs? 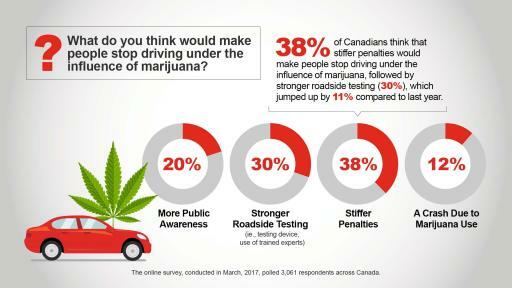 The survey also revealed that 86% of Canadians say they have not driven under the influence of a drug, whether prescription or illicit. However, 14% of respondents admit they have driven under the influence of a prescription or over-the-counter drug that was a stimulant or sedative, and 7% of respondents say they have driven under the influence of an opioid (narcotic) medication. 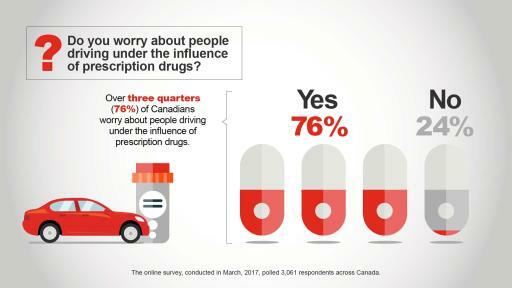 75% of Canadians worry about people driving under the influence of prescription drugs. When asked what age group people associate with prescription drug-impaired driving, respondents were split between people aged 16-25 (27%) and people aged 55 and over (27%). Interestingly, respondents in these two age groups associated their own age bracket with prescription drug-impaired driving the most. 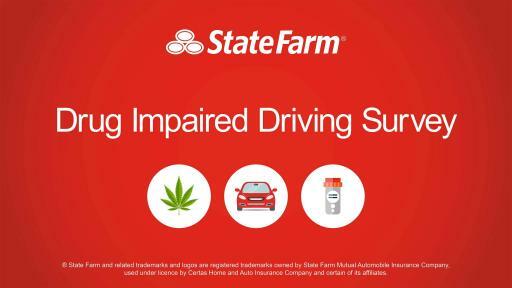 This is the first of three news releases State Farm will distribute in 2017 revealing survey results and the opinions of Canadians about their driving habits and road safety. The online survey, conducted in March, 2017, polled 3,061 respondents of driving age across Canada. In January 2015, State Farm’s Canadian operations were purchased by Desjardins Group, the leading cooperative financial group in Canada and among the three largest P&C insurance providers in Canada. With its 500 dedicated agents and 1700 employees, the State Farm division provides insurance and financial services products including mutual funds, life insurance, vehicle loans, critical illness, disability, home and auto insurance to customers in Ontario, Alberta and New Brunswick. For more information, visit www.statefarm.ca, join us on Facebook – www.facebook.com/statefarmcanada, or follow us on Twitter – www.twitter.com/statefarmcanada. ®State Farm and related trademarks and logos are registered trademarks owned by State Farm Mutual Automobile Insurance Company, used under licence by Certas Home and Auto Insurance Company and certain of its affiliates. ©Copyright 2017, Certas Home and Auto Insurance Company.